Total album duration 65 mins." 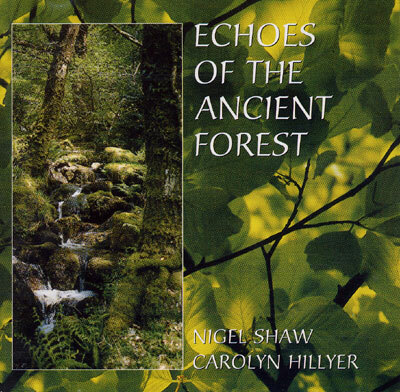 ""Echoes of the Ancient Forest has now become one of our best selling albums and is highly recommended by many practitioners for massage, healing, relaxation and inspiration. Willow, alder, hazel a great forest once rolled in vast unbounded waves across the old land, an immense changing sea of damp shadow and green light pouring over the soil. Birch, thorn, ash the roots of the ancient trees reached into the deep heart of everything and their branches were locked in a perpetual dance. The forest nurtured all life within its wide embrace. Oak, yew, beech then the world briefly turned away and in that time the body of the forest was sacrificed until only its spirit was left. Now the few trees that remain grow within a ghost forest. But the murmur of ancient sap rises in their veins and the hidden memories of the great ancestor trees are held within their seed. Holly, elder, rowan the ghost forest is still here. It breathes sweet winds across the flat, dry fields and it's whisper echoes into the empty corners of the land, echoes of the ancient forest. The roots of this album are natural recordings of forest sounds and birdsong from surviving ancient woodland on Dartmoor. Gentle improvisations of wooden flutes, traditional whistles, keyboard and voice are blended to evoke the atmosphere and delicate beauty of our lost forest."" Track titles: Willow, Birch, Oak, Holly. Highly recommended by many practitioners for massage, healing, relaxation and inspiration.